Most MG's are commonly thought of as 4 cylinder cars, the modern exceptions are of course the MGC and MGB GT V8, however in earlier times there was a tradition of 6 cylinder MG's starting with the 18/80 range that was introduced in 1928. The cars that really set the foundation of this tradition were the MG Magnas and Magnet-tes that were produced between 1932 and 1936, the most popular being the F type Magna with a production run of 1250 cars. There was a definite gap in the MG range in the early thirties and Cecil Kimber realised that they had to produce something midway between the very successful 8 horsepower Midgets and at the other end of the scale the 18/80 range. In 1930 the Woleseley Hornet was introduced, powered by a delightfully smooth 12 horsepower engine, however the rest of the car was totally uninspiring and although Kimber no doubt thought that a 12 horsepower Midget was a good idea, nothing materialised due to all effort being concentrated on the double Twelve M Type Midget and the C type Montlhery Midget. The first 12 horsepower Magna was introduced in September 1931 and was known as 'the light six'. This car was to be the MG Car Company's venture into the smoother running six cylinder sports car market and was basically a C type that was stretched by 10" in length and powered by an M type engine that had two extra cylinders added. The hefty power unit was taken straight from the Wolseley Hornet but was camouflaged by MG engineers externally. Twin carburettors helped produced a modest 37 bhp and performance was less than startling and the car sold well if only that it looked the part. The six cylinder cars were however to be produced in relatively small numbers compared to the Midgets of the era as they did not generate quite the same affection performance wise. Although smooth, they did not give quite the exhilaration of the smaller MG's. The appeal for the six cylinder cars was nonetheless understandable when you consider that most of the 1930's cars had solidly mounted engines and non-synchromesh gearboxes and when directly compared with their four cylinder counterparts, the 'light sixes' ran far smoother with less vibration. The K types followed in 1932 and will be long remembered for their numerous racing successes. The MG range of models was already quite varied when at the Motor Show of that year the K series was launched. Following on in logical sequence from the very popular J types, the K1 and K2 utilised the now familiar and well established conventional MG chassis layout. A1096cc power unit was employed and was an improved version of that used in the Magna with a stronger crankshaft and a cross-flow cylinder head. There were several versions offered and each one was a little different from the other with chassis and engine variations. There was also a racing version on offer designated the K3. To add to the confusion there were also four different body options; four seat saloon, four seat tourer, four seat open and two seat open. It goes without saying that with this confusing array of options available, the cars were only produced in relatively small numbers. At this time Abingdon were not only producing a bewildering assortment of competition cars but the company's production cars were to become even more varied with the introduction of the L type Magnas in March 1933. The new improved Magna shared the shorter stroke six cylinder engine used in the K Magnette. The engine known as the KC type was in fact a KB unit with coil ignition and twin carburettors. The shorter stroke of 57mm x 71 mm was identical to the racing Midgets of the time and with a capacity of 1086cc it put the new car neatly in the 1100cc class. An important innovation on this engine was the new cross flow cylinder head with six ports on each side, this boosted power to 41 bhp at 5500 rpm. The KB clutch and 4 speed gearbox of Wolseley origins were employed which were essentially the same as those fitted to the J type Midgets. The L types were genuine 75 mph motor cars and were considered better than their predecessors. They did however retain the characteristic sloping radiator that was a feature of the previous Magnas and they were fitted with flowing swept wings of similar design to the then current J type Midgets. The L types utilised a long wheelbase version of the K series chassis but with a track of 3' 6" instead of the K series 4' 0" track. The L1 was a four seater car with an option of an open or closed body and the L2 was an open two seater tourer, similar in appearance to other MG's of the period adopting same body styles of earlier Magnas and Magnettes. There was an exception however and this was the L1 Continental Coupe. Cecil Kimber could not resist the temptation to experiment with saloon based models and this particular offering from Abingdon became affectionately known as 'Kimbers Folly'. Unfortunately the car did not sell particularly well and it is reported by Mike Allison in "Magic of MG" that one hundred were made and they took as many weeks to sell! 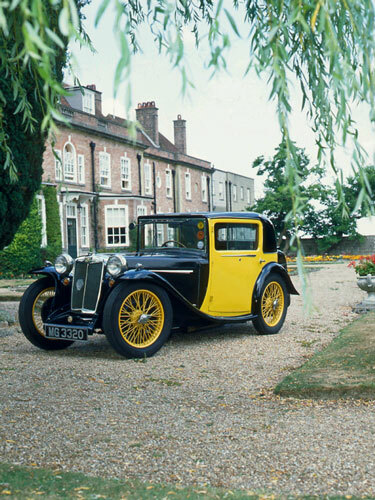 The Continental Coupe was available in bright two-tone colour schemes, generally canary yellow and black and its coachbuilt body was to the highest standard. Fairly innovative was the rear end styling which on first inspection gives the impression of a large boot for luggage stowage. This could not be further from the truth for inside there is only just room for the petrol tank at the back of the compartment with the spare wheel shoehorned in for good measure. Atop the boot was an elaborate fairing which incorporated an illuminated number plate, brake and stop lights and originally an early form of direction indicator (these have been replaced on the featured car. for safety reasons). The interior was well appointed if not a little cramped and could really only accommodate two adults in comfort, but an occasional rear seat was provided that would normally be occupied by accompanying luggage. A feature of the car was the delightful sliding glass sunroof which could be adjusted to give controlled ventilation and at the same time allow light into the cockpit making it less claustrophobic. Engine: 6 cylinder in line. Bore and Stroke: 57mm x 71 mm. Valve Gear: Overhead camshaft driven through vertical dynamo. Power output: 41 bhp at 5,500 rpm. Gearbox: 4 speed non-synchromesh 'crash' gearbox. Brakes: Bowden cable operated 12" drums. Suspension: Half elliptic front and rear with sliding trunnions. Wheels: Centre lock wire spoke. Wheelbase:7' 10 3/16". Track: 3' 6" front and rear. Fuel consumption: approx 23 mpg. Number built: 100 Continental Coupe; 486 (total of all variant body styles). We can help you with everything you need to enjoy, maintain and run your MG at reasonable cost: Spares, Insurance, Technical Assistance, Servicing, Restoration, Club runs, Travel opportunities, Local Club activities, Magazine and other quality informative publications, Recommended suppliers, Racing Championship and much more.